Responsible for development, implementation and ongoing management including financial accounting of a dietetic internship with information technology concentration utilizing multiple facilities for supervised practice experience. Awarded multiple grants. Selected for multiple publications. Received 2011 Staff Excellence award from University of Maryland College of Agriculture and Natural Resources for cumulative efforts over 10 years. Responsible for 35-bed skilled and long term care unit in a Continuing Care Community as well as consultation with Assisted Living and Independent residents regarding diet and food service. Complete monthly and quarterly quality assurance activities for Dining Services. Responsible for clinical care and overall management of food service in 140 bed long term care facility. Developed and implemented food service department improvement program including computerization, new equipment acquisition, on-the-job staff training and creative recruitment. 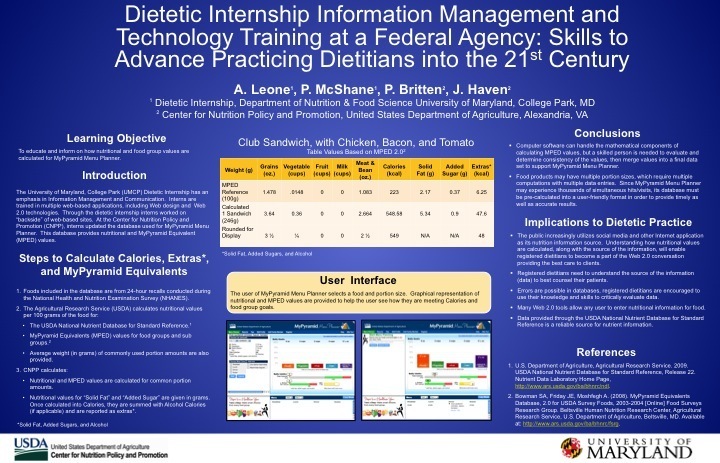 Responsible for management of the Baltimore-Washington AP4 dietetic internship in multiple facilities. Provided food service supervisory and clinical staff relief; implemented customer service program. Responsible for all food service and clinical operations in a 70-bed satellite hospital unit. Trained, developed and managed sixteen professional and hourly employees. Responsible for teaching advanced junior and senior year courses to students enrolled in coordinated undergraduate dietitian training program. Research activities focused on body composition changes. Responsible for providing all aspects of nutrition management to lung and esophageal cancer patients. 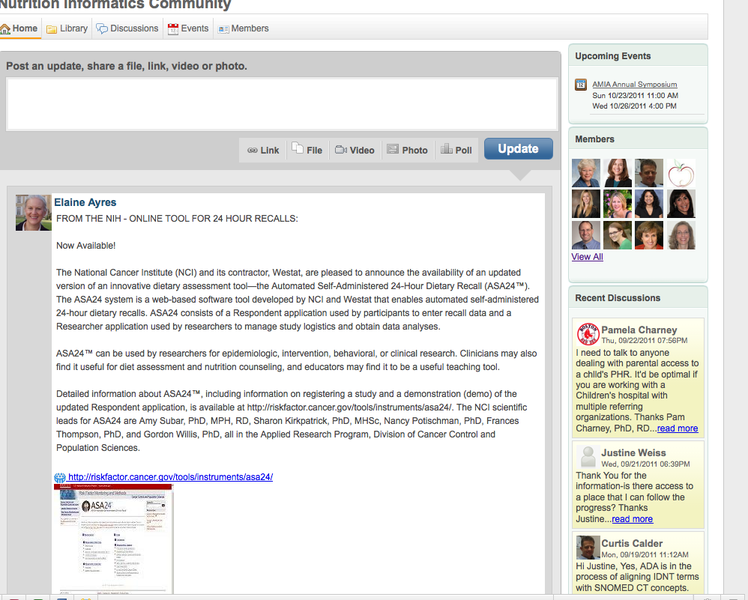 Wrote a industry funded grant and completed a lung cancer nutrition project; multiple publications resulted. 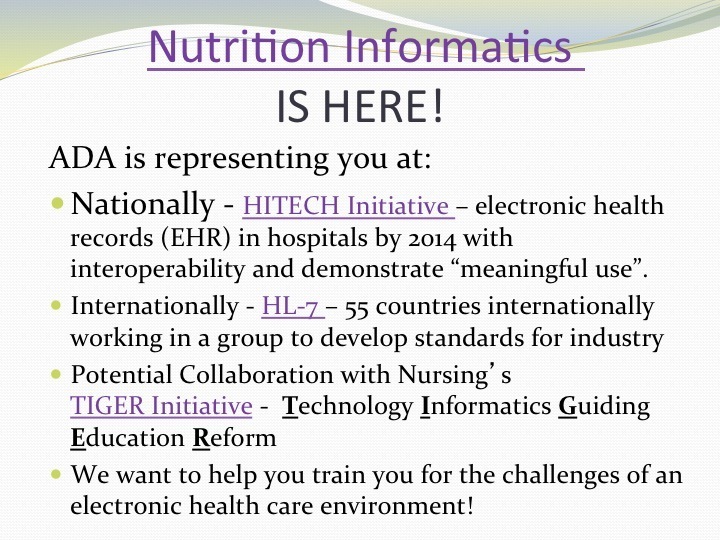 Selected by the American Dietetic Association (ADA) to serve a three-year (2010-13) term on ADA Nutrition Informatics Committee. 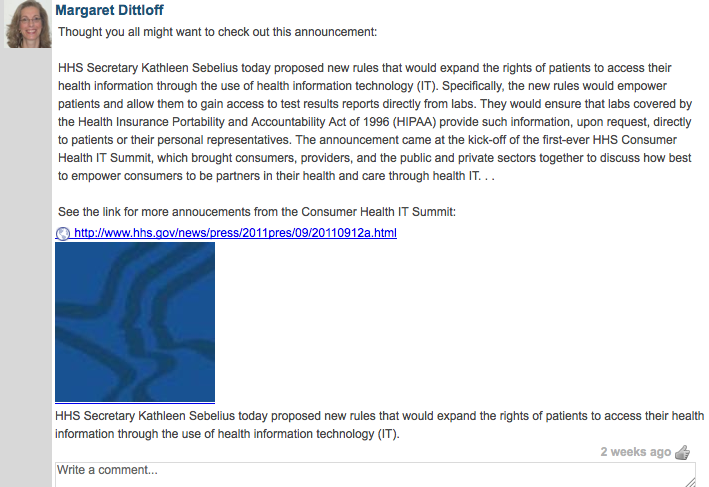 Committee assigned to develop training and guidelines to move the dietetics profession into electronic health records by 2014. 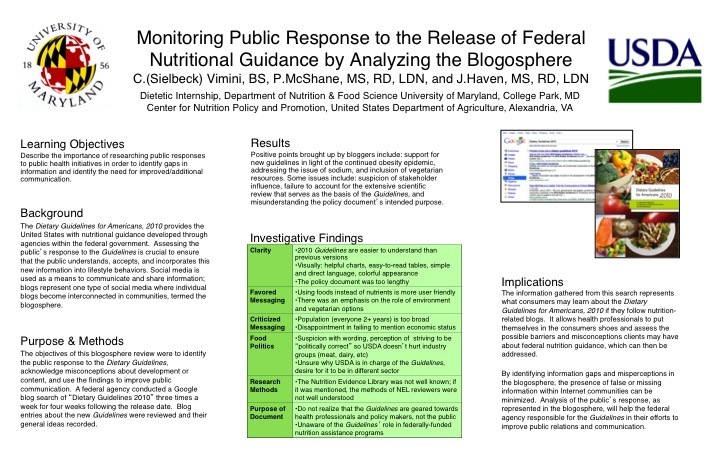 Selected by USDA Center for Nutrition Policy and Promotion for Expert Reviewers Panel as technology member assigned to systematically review dietary intake research in children (2010-2011). 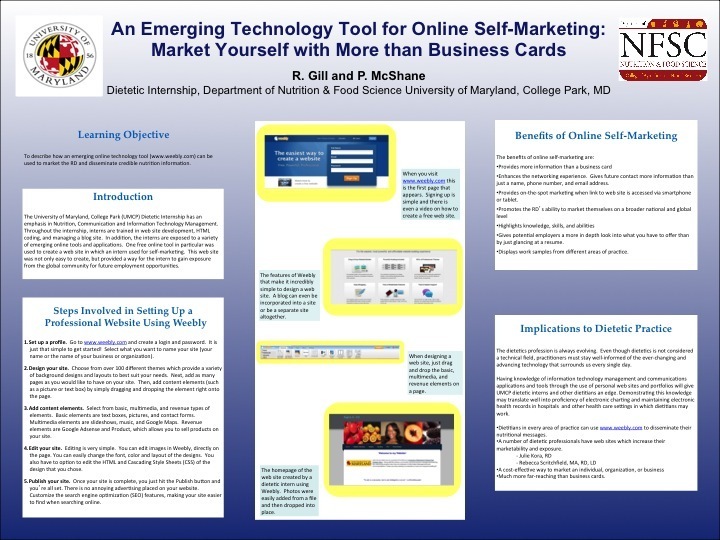 Multiple practice-based technology abstracts accepted each year for presentation and subsequent publication at the annual meeting of the American Dietetic Association. Selected by the University of Maryland College of Agriculture and Natural Resources for Staff Award for Excellence in May, 2011. Martha F. Trulson Scholarship (1981): The American Dietetic Association. Herbert and Lillian Powell Fellowship (1981): The University of Chicago. 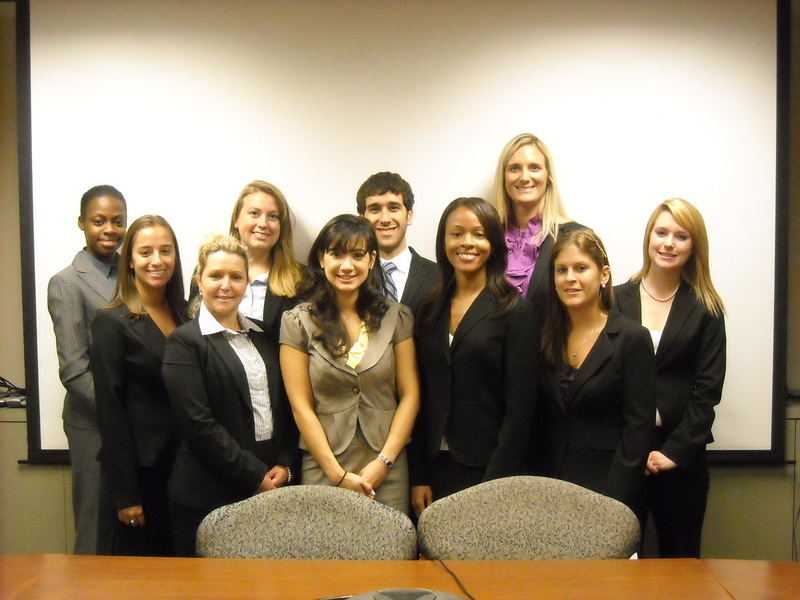 MDA PAC chair (2008-present): The Maryland Dietetic Association. 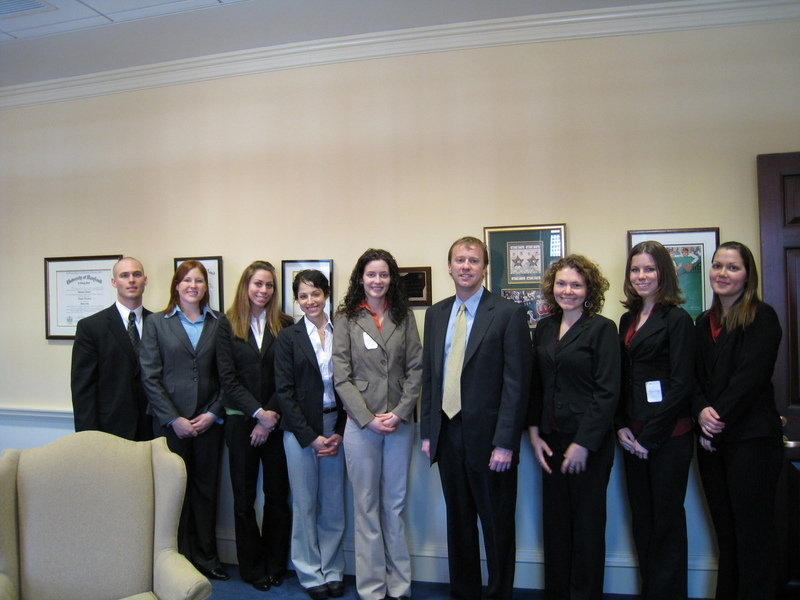 Member: Maryland State Board of Dietetic Practice (2000-2004), appointed by the Governor. Maryland Medicaid Committee member (1995-1996): The State of Maryland. 2011 Staff Excellence Award: University of Maryland College of Agriculture and Natural Resources.